A node red flow consists of a series of interconnected nodes. (wired nodes). All nodes must have an input and can have 0 or multiple outputs. 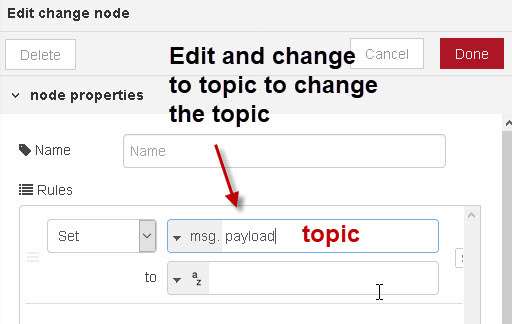 Nodes exchange data between each other using the msg object. Each node receives the message object from the previous node, and can then pass this message object onto the next node in the flow. You can see the message properties by sending the msg to the debug node. 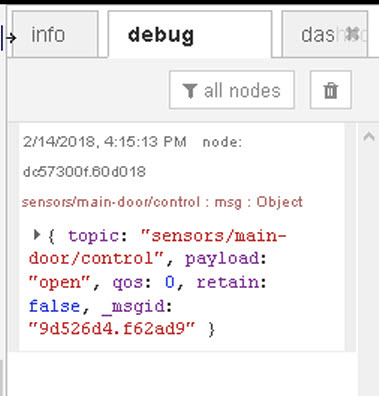 By default the debug node will display the msg.payload property but you can edit the debug node to display all of the message properties. If you Look at the message object properties of the the inject node. 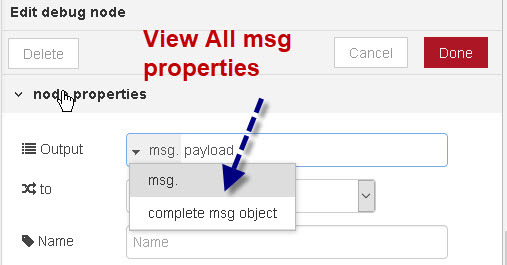 The _msgid property is a message identifier added by node read and can be used to track message objects. You can find out more of what they do by dragging them onto the flow and then viewing the info tab associated with them. First of all thank you very much for you excellent articles. I would like to display these 2 values in 2 gauges on a node-red dashboard. How can this be achieved? Figuring out all the various data formats has been my brick wall in making Node-Red to work for me in my home IOT. Your discussion here told me more than a month of experimenting on my own has. Thanks. I need to send this data (Well, not all of it, just the “payload” of ‘on’ or ‘off’ and the “bri” value) to another Raspberry Pi using MQTT. But, MQTT only passes “Payload”. How can I put the data into the payload? I assume a function to “encode” it on the sending end and another function to “Decode” it at the receiving end, but is there an easier way that you can think of? As for your problem. I assume that the object is the payload object. If s you pass it into a function node and strip out the payload and brightness and maybe extract the device name for the topic. If that is the case then let me know and I’ll write the function node if you want. Use the ask steve page to send me the details. I am new to Node-RED and the whole IOT arena. I have become interested in home automation / security as a hobby and had been struggling with counting bursts of messages from multiple sources. I had not been able to solve my problem till I stumbled on your web site. I read your articles on storing variables and Understanding The Node-Red Message Object in Node-RED and 15 minutes later I have what I want working and graphing the messages from each source. In my limited opinion your explanations were very clear and concise with sufficient supporting code to make extrapolation logical. They also happened to be very specific to my problem. I will read more of your articles as all the topics are on interest.